Succeeding in today’s competitive environment requires organisations to apply a strategy which allows them to innovate and rapidly grow while balancing costs and investments. Essentially this means developing the capability to manage products at each lifecycle stage from a single idea, to a strategic portfolio. These stages each contextually facilitate understanding and distinction where different management practices are best placed. For instance, in the first 3 phases, smaller bets are better made with lighter enabling governance to improve emergence and innovation potential. The days of the big business plans to forecast the future when you know least are long gone in favour for small, fast, evidence-based approaches which allow and cater for emergence. When value and opportunity emerge, then contextual management can be applied and grow ideas, products and businesses accordingly to support and identify growth opportunities. Consequently, all functions in any business need to be aligned to apply, contextual governance which connects ideas to strategic goals, in a lightweight fashion so that ideas are not confined to a few, but allow contribution from the many. Failing to understand the life stage of an idea and manage appropriately, will result in practices and cultures which will constrain innovation, responsiveness and lead to corporate complacency; a trait which kills companies of all sizes and types. In most organisations today the financial model focuses on efficiency through rigorous and somewhat mandated budgeting processes which emphasises variance management control comparing forecasts to results. The term efficiency in this sense is cost reduction and maximised margins, which is challenged in variable environments where cause and effect relationships are being discovered and/or new businesses are evolving. We should expect a responsible economic function to enable simultaneous exploration and sustainability to achieve continued performance, but sustainability needs to be redefined to include innovation to accommodate change and responsiveness. Sustainability can only be really achieved when there is an actual realisation that most of your products in your portfolio today will die in the nearer than expected future. A realisation is also required that products create living relationships with customers which require continuous nurturing and investment, which is especially true in tech and digital environments. This approach challenges the complacency and false sense of security which can materialise from previous successes, which often sees companies driven into responsive chaos to grasp survival from the back of the pack they once led. Global Venture Capital (VC) spend nearly doubled between 2013 to 2016 reaching an estimated $140bn annually. There has been $100bn alone invested in Fintech since 2010, and this market is positioned to be growing substantially ahead. Private Equity (PE) is accumulating record levels of capital for investment, reaching around $1Trillion in 2017. If you generalise to consider that Venture Capitalists create companies and Private Equity firms manufacture companies, they combine the strategy for simultaneous innovation and growth and are ruthless in doing so. Venture Capital is higher risk and weighted more on new ideas and innovation, Private Equity is weighted more in execution and growth, but Enterprises need to consider being both with strategic market ambitions. In both Venture Capital and Private Equity models, they approach investment from a Fund perspective where Venture Capital take greater risks and understand higher failure rates (>90% for startups). Therefore they spread bet smaller investments and double down incrementally while avoiding the trappings of budgeting too early in ideation and development stage. Private Equity companies invest at later stages generally from a strategic fund thesis supporting portfolio growth. Budgets are used for operational efficiency, but these companies acquired are more mature and established; what we could call the stages of ‘Grow and Sustain’ in the Lean Product Lifecycle. Unlike these investors, enterprises today generally still operate for efficiencies against annual budgets, which isn’t optimised for managing innovation and growth. Enterprises are weighted in governance from a different management era and are generally poorly positioned to manage ideation, innovation and responsiveness. We recognise this concern in the Lean Product Lifecycle and therefore advocate emergent and contextual governance which emulates and balances the practices of Venture Capital and Private Equity to create an ambidextrous Enterprise. The concepts of funds over budgets enables strategic management to surface. In addition to the budget, a fund structure should be applied to invest in new ideas and opportunities, not subjected to the same efficiencies and expectations as a traditional budget. Great ideas start small and shouldn’t need big budgets to test. It would be wise to position capital distinctly into areas of innovation such supported by associated with an innovation and growth thesis. Budgets then become contextual to life cycle stages where mature budgets have more traditional budgetary control than new ideas. This still means financial diligence and responsible investment applies and one could argue that by contextual application and smaller ventures, increased financial responsibility is achieved. New ideas and products are finding their way and discovering new business models. Many mistakes will be made as part of the forming process, and it’s crucial for teams to have the flexibility to move around and explore potential product-market-fit which might be different that adherence to a plan. This is not to say by any means financial diligence should be removed, just that profits and revenues are expected to be volatile in early stages of creation. More emphasis should be made on solving the problem identified through customer engagement and retention rather than profit based performance or process conformity. Innovation accounting focuses on the value of the product to the customer segment identified, which emphasises outcomes over outputs. 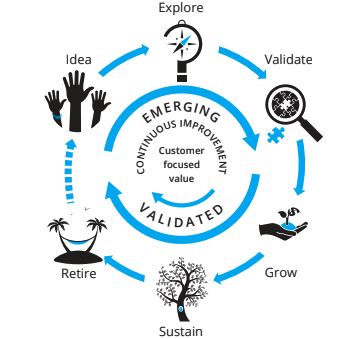 As ideas turn into products and business models, which mature and change over time, they should be scrutinised to their state in time, lifecycle stage and shifting context. It’s important to ask the right questions at the right time of the lifecycle stage. Mapping each of your products to its lifecycle stage will allow you to surface the appropriate governance. Management practice should be contextual and adaptive. The old adage ‘build it and they will come’ is too common a mindset when developing products. This approach can be a very high risk and has evidently resulted in the death of many promises of the next great idea. In markets which have many antilog and analogue patterns, you could argue that the risks are lower. Even though this might be true, you can never account for the unknown, unknown’s which only reveal themselves through practice and application. You’re not just validating the needs, but your own capability to solve that need through a repeatable and sustainable business model. Taking small evidence driven steps to validate assumptions, but then having the ability to scale when assumptions become facts is a strength to seek. Shifting from assertion to assumption in the earlier phases of a product changes the way you invest and acquire technology. Having the expectation that you will need to expand or contract rapidly is a smart way to fund and prevent dead cost. When considering long-term savings, consider the locked in cost incurred when products need to be killed and revenue reinvested. Innovation and growth require a fundamental shift in budgeting, execution and management. Enterprises who wish to grow and innovate should consider the duality with Funds and Budgets used by venture capital and private equity. Applying practices to manage products at their respective lifecycle stages while being adaptive to good or best practice methods for context and culture fit can provide many advantages. In our book the Lean Product Lifecycle, we provide a practical set of tools that product managers and teams can use to help them focus on the right questions and the right time by identifying their Lifecycle stage. Supporting these stages we advocate product and investment councils to enable these ideas to move through their respective stages with appropriate lenses of management. Utilising ideas from Lean, Lean Startup, Agile, High Growth company practices and cultures, we aim to encourage the creation and development of ambidextrous organisations. You can contact myself and the other Lean Product Lifecycle authors on Twitter at @LeanPLC or join our LinkedIn Lean Product Lifecycle Group.